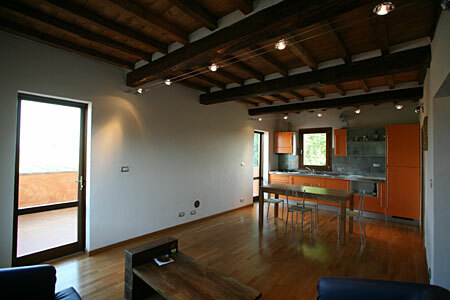 home > agritourism > the apartments > flai "Alba"
Comfortable suite, very spacious, arranged on two levels. At the first level is the living room with kitchen with large windows and a bathroom. The living room overlooks a large covered terrace (20 m2) with views of the vineyards and the farm.. At the top level are two double bedrooms and a second bath. The apartment is bright thanks to a triple exposure: North, East and South. The finishes are precious: Listoni wood floors, exposed-beam original oak ceilings, modern bathrooms. First floor - m² 50 - Apartment airy place on two levels open to double volume. Stay with kitchen and bathroom on the first level; bedroom of 20 sq metres on the second level with soppalcato floor of solid wood planking and railing with a view to stay below.